Underfloor heating has become more popular in UK households because the technology is now cheaper and people are starting to realise the benefits this form of heating presents. It’s not difficult to have installed, whilst being perfect for those renovating a room or completing a new build. As you would expect, the system is built under the floor and allows heat to naturally rise in the room. There are two types of underfloor heating; wet and dry systems. Both can be used in combination with any floor and property and the only thing that could change are the heating requirements. Underfloor heating can even be installed into oddly shaped rooms, and experts will be able to advise you on everything to provide you with the perfect heating system. Wet underfloor heating systems allow you to heat water up to temperatures of 65°C. Hooped pipes are installed under the flooring and water is pumped through at a low pressure. This water is supplied by your central heating system, whilst thermostats and manifolds control water temperature and flow rate. With underfloor heating, condensing boilers are often the most energy efficient. Thermostats are installed into every room to ensure you can carefully select your home’s temperature at all times. 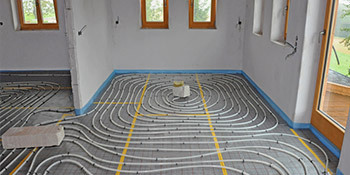 Electric underfloor heating involves cables being fitted one or two inches below the floor surface. It’s possible to install in any property or floor type, but installation is made easier if combined with a new build or renovation. Any flooring material is also possible with this form of heating, including vinyl, tile, wooden and laminate. And as the technology has advanced it has become more efficient and also cheaper to install. Ribbon cables and heating mats provide much greater energy efficiency. Whilst water is heated to a lower temperature than wet systems, it’s still sufficient for your home. If you’re thinking of a way to heat your home more efficiently whilst keeping the maintenance and installation costs down, underfloor heating systems could be your answer. For up to four FREE quotes from local, vetted and reputable companies, just complete our quick underfloor heating quote form. You can compare the underfloor heating cost and decide if it’s suitable for your property. Properties are given an energy ranking depending on how efficient they are and ratings are shown in the data beneath. This varies from A, the most energy efficient, to G, the least efficient. With a higher rating you're more likely to have cheaper energy bills as more heat shall be retained in your home. You can boost your home's efficiency with insulation including upvc double glazing, loft lagging or wall cavity insulation. The information underneath reveals the diverse types of homes in Uk. The most commonplace properties all around the UK are detached and semi-detached households. Other types of houses encompass terraced houses, flats, converted flats and bungalows. The data listed below gives an indication for the number of homes in Uk that are central heated and non-central heated. Households are heated by a number of sources which reflect how costly yearly energy bills will probably be. Types of central heating include gas, electricity, oil, solid fuel and LPG boilers. Changing the way in which your house is heated can see you with cheaper bills. The data below reveals the spread of homes heated by various fuels. Throughout the UK the most common undoubtedly are gas heated properties, followed by electricity and then oil. Biomass boilers are also growing in popularity, heated by sustainable products such as wood pellets or agricultural waste.|Homes in Britain are warmed by a range of fuels, including gas, electricity, oil, solid fuel and LPG boilers. Each fuel has a varying cost associated with it so you might find yourself with less costly energy bills by switching how your home is heated. Even solar thermal panels are being regarded as by many people in order to lower heating bills for the years to come.